The rents of several dwellings in 1873 and 1898 are known. In 1873 they ranged from £3 per annum (Mary Palmer) to £5 7s 6d pa (James Jenkins). The average rent was around £5 pa or about two shillings a week (10p). Some of the character of Preston has been preserved by its old buildings particularly around Preston Green (see below) and The Wilderness at the junction of Charlton Road and Chequers Lane. 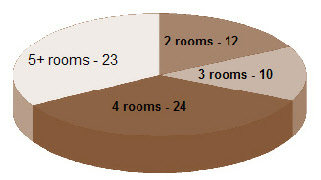 The 1891 census reveals the number of rooms in each home. (see chart right). As one would expect, the tradesmen and farmers enjoyed the luxury of homes with five or more rooms. Some families lived in cramped conditions which would be unacceptable today - Frank and Emma Brown and their eight children aged 11 to 6 months lived in three rooms and my grandparents, Alfred and Emily Wray, with their five children aged between three and eight squeezed into just two rooms in their tumbledown cottage at Back Lane. Surveying the surviving homes from the nineteenth century in Preston and examining old photographs of the village, reveals that the cottages were built in a variety of styles. Most were brick-built. 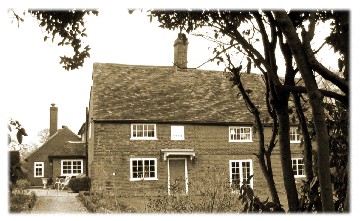 Some, like ‘Rose Cottage’, Chequers Lane, were constructed of brick in a timber frame. 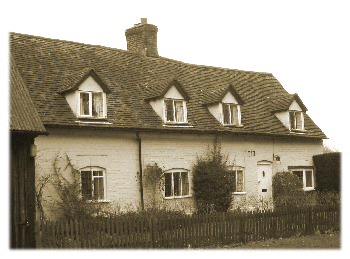 Several homes such as ‘Spindle Cottage’, Hitchin Road and the cottages at Crunnels Green had dormer-style windows at first-floor level. The cottages were mainly roofed with small orange/red tiles. 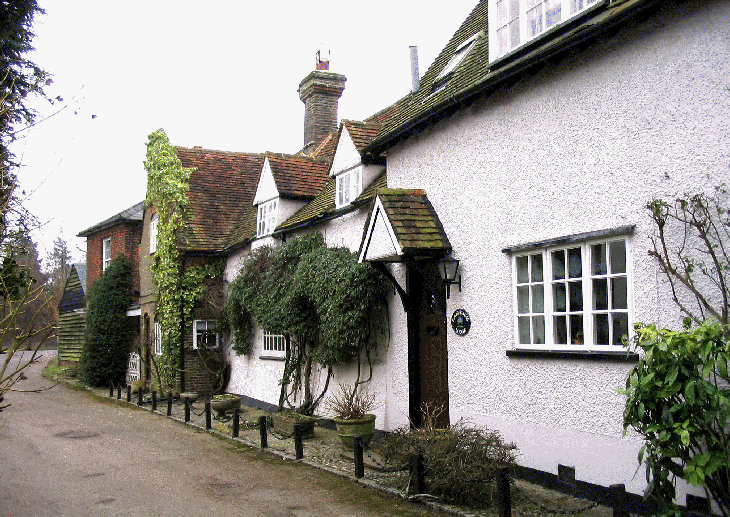 A few were thatched - such as Joseph Peter’s cottage at Preston Green and some on the north side of Chequers Lane. Considering the quantity of flint in the area, perhaps it is surprising that this was not used to construct cottages. Several properties in the village were built in the early eighteenth century - ‘Spindle Cottage’ (1717) (right) and ‘Sadleirs End’ (1690 with additions in 1719) (below). The housing stock in the Preston area gradually decreased between 1851-1891 from 82 homes to 74 cottages. However, in 1891, twelve cottages were unoccupied and the number of abodes was at its lowest in 1901 (66) which suggests that some dwellings were becoming uninhabitable and were being demolished. The early twentieth century saw several groups of homes being torn down at Back Lane, Chequers Lane, Church Lane (overlooking the Green) and School Lane from Crunnells Green Corner to the Red Lion. The housing stock in the Preston area gradually decreased between 1851-1891 from 82 homes to 77 cottages. However, in 1891, twelve cottages were unoccupied and the number of abodes was at its lowest in 1901 (64) which suggests that some dwellings were becoming uninhabitable and were being demolished. The early twentieth century saw several groups of homes being torn down at Back Lane, Chequers Lane, Church Lane (overlooking the Green) and School Lane from Crunnells Green Corner to the Red Lion. Two farms were also demolished. It is widely felt that the condition of the farm labourer is still very far from what it ought to be. Recent legislation in the form of Allotment Acts, Acts for the better housing of the working classes, Free Education and Parish Councils are evidence of the interest taken in his welfare. And though it is to be feared that some of these Acts have been shaped and passed more with a view to electioneering contingencies than through a disinterested desire to benefit the agricultural worker, still, the fact remains that they are evidence of the expressed will of the country on the subject. It is our duty to welcome them as such and to extract what good we can from them. The condition of the dwellings of farm labourers differs considerably in various parishes. Where the whole or greater part of the parish, with all the cottages in it, belongs to a wealthy proprietor who takes a personal interest in his estate and those who dwell in it, the cottages and gardens of the labourers leave little to be desired. But in the case of smaller estates, where the cottages occupied by the labourers do not belong to the owners of the estates on which they work, but to small owners, a very different state of things exists. And it is to this condition of things that many of the evils from which the agricultural labourer is now suffering may be traced. And here it may be advisable briefly to refer to some of the causes which have led to the present state of things. It was doubtless a direct encouragement to thrift that a poor man should be enabled to invest the savings of years in the purchase of a cottage or cottages. He found in this way, an investment which not only gave him a good return for his capital but added the additional pleasure of enabling him to gaze daily upon the fruits of his labour and care. Nor can the owners of estates be justly blamed for contributing to if not preventing this state of things. They found cottage property a very expensive possession. That their labourers could get cottages somewhere else and relieve them of the worry and expense connected with housing them was in the days of the unenlightened conscience something to be thankful for. But consider how the system has worked. Many of these cottages were built on small plots of ground filched from the waste, or on other tiny plots of ground (for land has always been difficult to acquire) so small as to be utterly incapable of forming a garden for the cottage and of growing vegetables sufficient for the requirements of the occupant. The owners also, tempted to obtain as large a return as possible for their outlay, in some cases sub-divided the garden and cottage so as to get two rents: in other cases, they built another cottage adjoining the first and divided into two a garden which was not nearly large enough for one cottage. In most cases the owners have been unable and in many cases unwilling to spend any money on repairs with the result that the roofs, ceilings, walls, floors not to mention the windows have been allowed to get into a shameful state of repair. Of these cottages, many have only one bedroom: most of the rest in addition to the one decent bedroom (if it can be called such) have a little make-shift bedroom on the landing at the top of the stairs where often two or three sons and daughters sleep. It is true that the Sanitary Authority has power to condemn houses that are unfit for human habitation, and can cause them to be closed. This is what Dr Turner the Medical Officer for Health of the Hertford Rural Sanitary Authority says in a recent report: “The housing of the working classes is a matter of great public importance. The question however is one with which it is exceedingly difficult to deal. It appears a simple matter to condemn a house as unfit for human habitation and cause it to be closed. But it must be remembered that there are a certain number of persons in the district who must be housed and must be housed too within a reasonable distance of their work and that a cottage pulled down or closed is not necessarily rebuilt or repaired and made fit for habitation, because the rent which an agricultural worker can afford to pay does not make the erection of houses, such as would in these days be considered fit to live in, remunerative as a speculation. Dr Turner here puts his finger on the main difficulty of the question – the great scarcity of decent cottages and the impossibility of meeting that difficulty by building cottages as a remunerative speculation. Not very long ago a cottage was condemned in the district of the Hertford RSA and the occupant, a hay binder who earned good wages had to go into the Union (workhouse) for a time with his wife and family because there was no other cottage vacant. It may be said that the Sanitary Authority has power to erect cottages at the expense of the rates where they are required but it is to be wondered at that in these depressed times every effort is made to keep the rates down and not impose additional burdens. For it must be patent to everyone that what cannot pay the individual is far less likely to pay a public body when carried out at public expense. And the erection of cottages by the SA not only means a heavy burden on the rates but it is a burden which must be felt to be unjust and iniquitous by most of the ratepayers. So why are additional cottages necessary? Simply because one or more landowners have not on their own estates cottages sufficient to house the labourers whose work is a necessity if their estates are to be worked as they ought. And it is these landowners who would be specially benefited if cottages are built. In other words, the rest of the ratepayers are to be taxed in order that these may be able to have cottages for their labourers to occupy. Ought it not to be laid down as an axiom that every agricultural holding should have upon it cottages sufficient for the housing of the labourers who are necessary to work it? A tenant who takes a farm expects that his homestead should contain buildings for the stock, the produce and the implements to use on the farm. Why is there so little thought about the housing of the labourers without whom all the rest would be worthless? But supposing that all are agreed upon the principle that every farm should contain a sufficient number of labourer’s cottages, how is this reform to be carried out? The impoverished land owner is not in a position to do so. His burdens at present are greater than he can bear. Might not the State be reasonably expected to give him some help in carrying out what would be a benefit to the whole community, more especially if it could be done without making any material addition to the rates or taxes? What then would be the cost of carrying out such a scheme as this and what might reasonably be expected of the landlord? It may be taken for granted that an agricultural labourer in most parts of Hertfordshire is unable to pay more than £4 10/- as a yearly rent of his cottage. Good cottages, and such only ought to be erected, containing three bedrooms with sitting room and kitchen can be built for £300 a pair. This is simply the cost of building and includes neither the value of the site nor the expense of fencing. Supposing then that the government could be induced to lend money to landowners at 3% for building these cottages in pairs, the rent of the two cottages (£9) would just cover the interest. Would it be too much to require the landlord, considering the great benefit that would accrue to his property to provide each cottage with half an acre of garden and to fence it? Land is cheap enough now to insure that each labourer should have around his home a garden sufficient in size to supply his family with vegetables and to enable him to feed a pig should he wish to do so. An allotment is but a poor substitute for a garden and there is very little demand for allotments amongst agricultural labourers, at least in Hertfordshire. His daily work is too hard and the hours of labour too long to allow him to trudge off to an allotment to which he has to convey manure, seed, tools and everything else which may be required when he returns home tired and wearied after the labours of the day. But give him a decent home and a garden around his house and more will be effected than can be done in any other way to improve his condition. Nor is it the labourer who will be benefited. How often now is the farmer heard to complain that it is the want of decent cottages which causes the dearth of superior labourers. While the landowner, by the grant of a piece of land which comparatively is worth little and by fencing it will see his property improved and the condition of the labourers on his estate greatly benefited. In the carrying out of such a scheme as this may be found perhaps also the solution of some of those economical difficulties which are causing so much anxiety at the present time. Take for example the exodus of the young country labourer to the large towns. How many such would remain in the villages were the condition of their homes improved? And how many having tasted the disappointments which await them in the large towns would gladly return but for the thought of their overcrowded homes and the uncertainty of always finding work? But with more room and decency in their homes and a garden of a size which would enable them to employ their labour profitably should work on the farm become slack, many would be thankful to get back once more to their native village. Then there is another aspect of the question. At present the best girls in the families of labourers go into service and having acquired habits of decency, comfort and self respect can seldom be induced to return and settle down in the wretched cottages to which they were once accustomed. The girls who remain at home are certainly not the most hard-working, careful and thrifty, but it is from these that the labourers are of necessity obliged to choose their wives. Those who go into service look forward to marrying and settling down in circumstances very different to those in which they were brought up. But would it be so if they were brought up in better homes? Would they not on the contrary be likely to look forward at the close of their period of service to returning to their native place and settling down in homes where husbands and children would in time reap the benefits of their experiences? Such are some of the benefits which would result from the carrying out of a scheme of the kind suggested but it would have to be made compulsory if any general good were to arise from it. Some competent authority could easily be found to decide as to the number of cottages required on each holding. In some cases there is little doubt the landlords would erect the cottages at their own cost, in others they may wish to have the loan so arranged that capital and interest should be paid off in a certain number of years; while in other areas, the interest on the money lent would remain as a permanent charge on the estate.